Where can you stream Rascal Does Not Dream of Bunny Girl Senpai? On 2018-10-04 Animation/Comedy TV Series Rascal Does Not Dream of Bunny Girl Senpai first aired on Asahi Broadcasting Corporation. 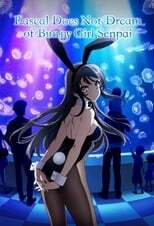 Written and created by , and produced by Clover Works, Rascal Does Not Dream of Bunny Girl Senpai has ended and last broadcasted on 2018-12-27.